There is something about a large dog that inspires many feelings inside of people. Some people get the feeling of cold fear and others get the feeling of respect and awe. However you feel when you see the muscles of one of the world's largest dog breeds rippling, here are 35 pups over 70 pounds that will get your heart pumping. Remember when viewing the weights, the lower weights are the females and the higher weights are the males. While there are exceptions to the rule, typically female canines are smaller than their male counterparts. Don't be alarmed by the size of these dogs. Some of the world's largest dog breeds are also the best for families and active pet owners. You will also find dogs on this list that will make good working, sporting and guard dogs. Whatever type of dog you're looking for, you're sure to find one on this list! Whether you are getting a guard breed or a companion breed, all dogs on this list are suited to people who plan to spend a lot of time with their four-legged family member. Unlike with small breeds, you can’t just pick up these dogs when they are being naughty. You also can not expect to hold them in place with just a collar or leash. They need to be taught proper manners and obedience starting from a young age. Pictured above, these dogs are the most agile of the Mastiff breeds. The Boerboel is all strength and confidence. The word “Boerboel” means “farm dog”, and this pooch can do it all. Whether it is needed to pull carts, protect livestock, or guard estates, it is ready and able to do the job. 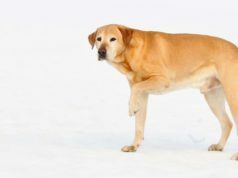 Hailing from the Canary Islands, this independent and intelligent fur-baby was traditionally used as a guard dog, as well as an all-around farmhand. The sheer size of this canine means it needs consistent, reward based training starting from a young age. It is not recommended for families with young children. A livestock guard, this shepherd dog has an almost lionish expression. They do well with alone time as they were breed to spend time out with the flocks. They do not do as well with people. If you own this canine, you need to excel at pack leader training and socialization so your dog isn’t a danger to your family and others. Another shepherding dog, this giant fur-baby has the disinterested look down pat. That doesn’t mean he is not paying attention. It is always alert and ready to spring into action at the first sign of danger. They view their family as their herd, and will be very loyal and protective, sometimes to a fault. While this breed is descendant of the great dogs of war and are kin to the fighting dogs of today, that doesn’t make this loveable pooch a fighter. Its purpose is as a companion dog and a local show dog. This pup likes human companionship and needs it to avoid becoming destructive or aggressive. This rare breed is native to Korea, pups in this breed are cute. They have happy faces capable of many expressions. Their appearance can be deceiving. This breed came about to hunt tigers, panthers, wolves, and other large animals. Tough and enduring, they can sleep in the snow and hunt in the mountains. Ferocious guard dogs, the Tibetan Mastiff is also patient, loyal, and kind. It is not certain what world's largest dog breeds came together to create this dog. Recently they enjoyed a period of popularity in China, but that time has ended. Once fetching up to $200,000 dollars a dog, dozens are sent to the slaughterhouse for $5 a head. Also known as the Romanian Bucovina Sheepdog, it is a stable breed that is calm and loving with children. Pictured above, these world's largest dog breeds also make great watchdogs with muscles and bravery to spare. Energetic, they need exercise and room to roam to keep from being a nuisance. They need to be socialized with people to avoid becoming aggressive. A Turkish livestock guardian, the Akbash is a guardian dog. It needs an owner who is familiar with pure dog personality, and can pack leader train. They are rugged and outdoorsy and will not be happy being a city dog. You will rarely see this strong canine as a companion dog. Like many of the world's largest dog breeds, they are a working dog and is happiest when it has room to work, and a daily “job” to do. A guard dog, they were bred to spend time away from human companionship and use much independent thought. This means they are considered stubborn and need an experienced owner. One look at this dog and you know it means business. They are powerful, athletic and do better being the only dog in the family. These pooches are not recommended for homes with young children or frequent get-togethers. While they are highly trainable, it takes someone with experience to make these canines anything other than a guard dog. This is one pooch that can protect and serve. They love children and do great with kids, but when danger is around they will do anything to protect their charges. These pups are reserved around strangers, and they don’t like other dogs. Also keep in mind that they are quite animals, but they do drool. A sight hound originating from France, this canine should never be off a leash. If they catch a scent, they are after it in a flash. A descendant of large Phoenician hunting dogs, this animal is still pretty large itself. They do better in active, outdoors families that can keep them busy. These world's largest dog breeds are the height of a small horse. Although they are not known to be aggressive, they need obedience training starting at a young age. When you think of a bull in a china shop, think of a Dane. They can easily knock down children without meaning to. Coffee tables are no match for these fur-babies. These adorable shaggy dogs have an irresistible hound dog look. A true gentle giant, the Wolfhound is a great companion pet. Don’t expect these world's largest dog breeds to be a guard dog, because they will just love strangers, too. If you are looking for a large dog that doesn’t have an aggressive bone in its body, then this is the one for you. From the fields of Turkey comes this livestock guard that is pretty good at guarding families, too. These pooches have a ferocious appearance, and the brawn and bravery to back that up with action. If you are looking for a companion pet, make sure this pup undergoes serious pack leader and socialization training. A corded dog, this fur-baby has long hair like dreadlocks, but it can also be kept clipped short. While it looks happy and cheerful, don’t let that fool you. This Hungarian livestock guard is still very protective. That does not mean it can’t excel in competition or as a family pet. Like other world's largest dog breeds, it just needs proper training. These large canines love to work. Originally used on the farm to pull carts, herd, and even protect. Today these energetic pooches do great in search and rescue, and as therapy dogs. You can also teach them to happily pull your kids around in carts or sleds. Like most dogs with thick coats, they are healthiest in cooler temperatures. Developed in the former Soviet Union, this traditional guard dog was developed from Saint Bernards, Caucasian Shepherds, and Russian Spotted Hounds. They are tall and big boned, but not clumsy at all. They are adaptable and can make a great companion while still being a protector. An independent, confident animal, this canine will try to be Alpha to other animals and humans alike. That being said, they need daily human companionship to keep from becoming aggressive. A tad lazy, this pup doesn’t need much exercise, but needs to be able to stretch out a couple times a day. An all-around dog, this breed was used to haul wood from the forest or nets from the ocean. Sweet-natured and gentle, they are great for families with children and frequent company. These fur-babies are intelligent and easy to train. They need daily companionship and “chores” to be their best. A rare breed, this guard dog has a “wait and see” attitude. When protecting sheep in Poland, they gather the sheep together and stay near them – not leaving them to attack. Although they had this trait, they were ready and able to back up these protective actions with physical fighting. Their fur was also shaved and used for wool, just like the sheep they lived with. Created by breeding a German Shepherd with a European Wolf, this breed is far removed from its wild ancestor. These pups are an echo to the dogs of old. They retain strong pack instincts and need room to roam and explore. A little timid and standoffish, this is not a companion dog. These rugged animals are for outdoor life only. Recently making the Guinness World Book of Records for the longest tongue, this dog is large…some would say giant. Created to rescue stranded travelers, these world's largest dog breeds are calm, patient, loving, and brave. They still make great working dogs today in therapy jobs, search and rescue, and even law enforcement. Similar in appearance to the Irish Wolfhound, this is another shaggy dog that is ready to jump into your heart. Although this is a large pup, it is friendly and playful – unless you are another dog. They prefer to be the only four-legged family member. Independent and with low intelligence, they are hard to train. These fur-babies have long, white hair that hangs down in their eyes. They are courageous, active herding dogs that need to stay busy. Pooches in this breed can be nervous and need gentle, but firm, training. They do better in smaller families with older kids, and large yards. The largest of the Artic dogs, these double-coated canines will keep you entertained with a variety of sounds. Known as a “talking” dog, it is loved by many, but don’t run out to get one just yet. Pictured above, the Alaskan Malamute only does well in cooler temperatures. They need an experienced, outdoorsy owner who can properly train and exercise it. Though larger than the English Bulldog, their personalities are very much alike. Descended from working dogs, this breed is often used for dog fighting. Make sure you get your pup from a reputable breeder that doesn’t breed for aggressive qualities. 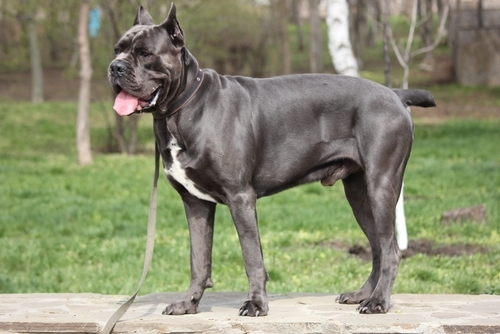 Created by crossing an English Mastiff with Anatolian Mastiff, these canines drool less than other Mastiffs; however, they are still quite large. Since these have been mainly bred as companion dogs, they are said to be more affectionate and mild mannered than some other Mastiff breeds. A new and relatively unknown breed, this pup hails from the old Saint Hubert’s Hounds of France and the Bloodhound. Intelligent and independent, these friendly canines are still highly trainable and make great hunting dogs and companion animals. Like most hounds, they are rugged and easy to care for. 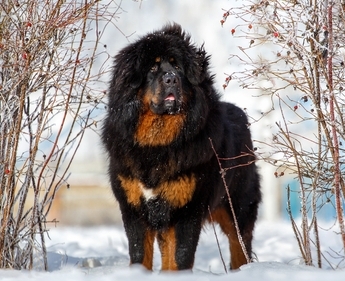 Coming in many different colors, you are sure to find one of these world's largest dog breeds that strike your fancy. Seen in the photo above, these dogs are loyal and territorial. They are better with kids they have grown up with, and they do not like other animals. Despite this they are eager to please and can be trained to be competition or therapy dogs. Just another Mastiff breed for this list, the “Japanese Mastiff” is ferocious and capable. These large canines can hunt and kill anything it wants with no assistance from its human. It is not recommended that you have this dog with kids or other pets. Only experienced owners and trainers need apply. An Alpha breed, these fur-babies cannot be babied or coddled. If you don’t lay down the pecking order, this pup will automatically assume that it is at the top. Not for the casual owner, this canine’s person must have the knowledge and time to make this a family or companion animal. From Uruguay, this breed is a descendant to the dogs brought over by Europeans. These pups are known to be aggressive. Abandoned by European colonists, these dogs competed with each other and only the strong survived. Although there are domesticated specimens of this breed, their history is that of feral dogs. They are not family pets, and that can’t be stressed enough. 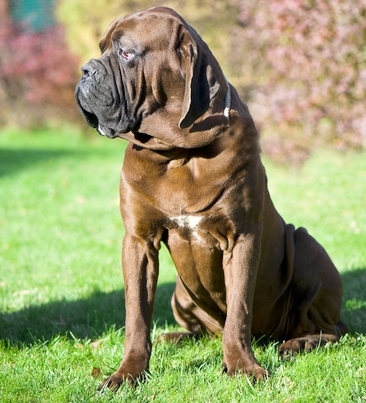 The Brazilian Mastiff is descended of Molosser breeds like the Bloodhound, and they definitely have the looks to show it. Distrustful of strangers, this pooch needs to be socialized properly to avoid becoming a danger to others. In fact, these dogs are highly anti-social and do not do well with company or kids.